This large public square in the center of Tel Aviv carries the name of Yitzhak Rabin, Israel’s first native-born prime minister. Working on the Israeli–Palestinian peace, he signed several historic agreements with Palestine as part of the Oslo Accords, as well as a peace treaty with Jordan. Rabin won the Nobel Peace Prize with Shimon Peres and Yasser Arafat in 1994. In 1995, during a peace rally, he was assassinated by a right-wing Israeli Jewish extremist. On the square’s northern edge, on Ibn Gabirol Street, next to the City Hall, you’ll find a small memorial that marks the spot of his assassination. A Holocaust memorial sculpture, a fountain, and an ecological pool were also built at the square. One of the most famous figures in Israel’s history is David Ben-Gurion, the founder of Israel who signed the Declaration of Independence in 1948 and Israel’s first Prime Minister. Located at Ben-Gurion Boulevard, his residential home in the 1930s, simple, cubic building, which is now a museum housing the living area, the original furniture, the library, historical documents, and titles awarded to Ben-Gurion during his years in the Prime Minister’s Office. 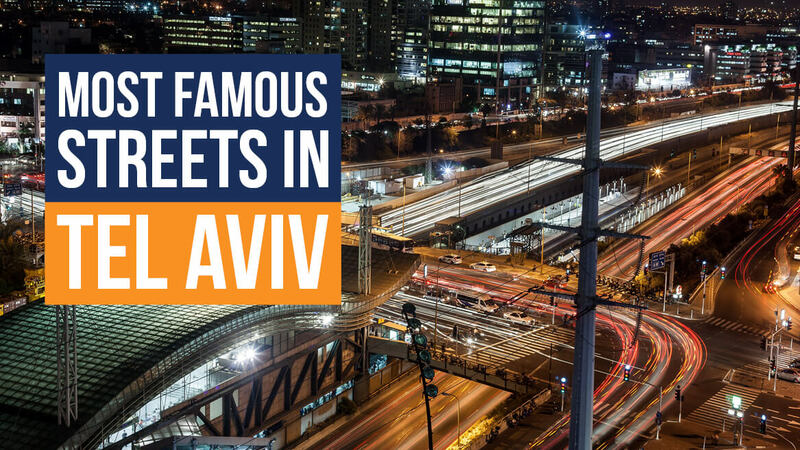 One of Tel Aviv’s landmarks and most famous streets is Rothschild Boulevard, located between Neve Tzedek and the Habima Theater. It’s a part of the White City of Tel Aviv, a UNESCO World Heritage Site. The street is named after Baron Edmond Benjamin James de Rothschild who donated money and land to the Jewish community. Walking or biking down its shaded, wide central strip, entirely lined with trees, you’ll see many large Bauhaus buildings, as well as the Independence Hall. This street is named after Theodor Herzl, one of the leaders of the Zionist movement and the author of ‘Altneuland’, in which he promoted Zionism. Several of the city’s first buildings were constructed on Herzl Street. At its end, on the site of the Herzliya Hebrew Gymnasium, the first mixed-gender high school built in 1910, in which subjects were taught in Hebrew, now stands the Shalom Tower, Israel's first skyscraper, which hosts exhibitions dedicated to the early decades of Tel Aviv’s social and architectural development. Built in the 1930s and named after Tel Aviv’s first mayor, Meir Dizengoff, Dizengoff Street is an iconic cultural and artistic hub. It’s a lively, bustling street that attracts both locals and tourist, thanks to its atmosphere, stores, coffee shops, restaurants, designer boutiques, and famous Bauhaus buildings. Don’t miss the Dizengoff Square and its famous (now renovated) Fire and Water Fountain. The square was named after Zina Dizengoff, Meir Dizengoff’s wife. This busy commercial center, packed with shops, restaurants, and cafes, is named for King George V of the United Kingdom who reigned during the British Mandate of Palestine. It was originally called ‘the Carmel Street’ after the popular Carmel Market situated in its western section. Dizengoff Center, Israel’s first shopping mall that opened in 1983, stands at the corner of King George Street and Dizengoff Street. The mall is situated on both sides of Dizengoff Street, so bridges and underground passages connect the two buildings. While on King George Street, check out Michael’s Square, Magen David Square, Meir Garden, and Metzudat Ze’ev. Stretching from King George Street to the popular Bograshov Beach, Bograshov Street is a place of youth and energy, where you can easily purchase sneakers, T-shirts, accessories, and second-hand vintage clothing. It’s named for Haim Bograshov, an Israeli politician, who helped establish the Herzliya Hebrew Gymnasium. He was one of its first teachers and later the principal. From Bograshov, turning into Bar Kochva, walk the short distance down Tsvi Brock Street, then up the stairs past the old City Hall, and you’ll find yourself in Bialik Street. Bialik Street is named after Chaim Nachman Bialik, Israel’s national poet who wrote his work in Hebrew, thus significantly contributing to the revival of the Hebrew language and creating Modern Hebrew poetry. Visit his home, the Bialik House, now a museum with the interior in the Arts and Crafts movement style. The Bialik House is also famous for its architectural style that combines European and oriental elements. On Bialik Street, you’ll see some of the city’s oldest houses, unique architecture, the old City Hall, which is now the Museum of History of Tel Aviv-Jaffa, the Bauhaus Foundation Museum, the Felicja Blumental Music Center and Library, and much more.